It's probably far too soon to introduce another cartoon character so soon after BATTLE PIG!, but when you're inspired you're inspired. For the past week Americans have been panicking about their impending financial doom. Finally Congress was able to pass measures to stop the United States from experiencing a sharp decrease in the budget deficit that would have led to a mild recession this year. while Dan colours beautifully within the line. Fiscal Cliff doesn't like puns (well, apart from his name). 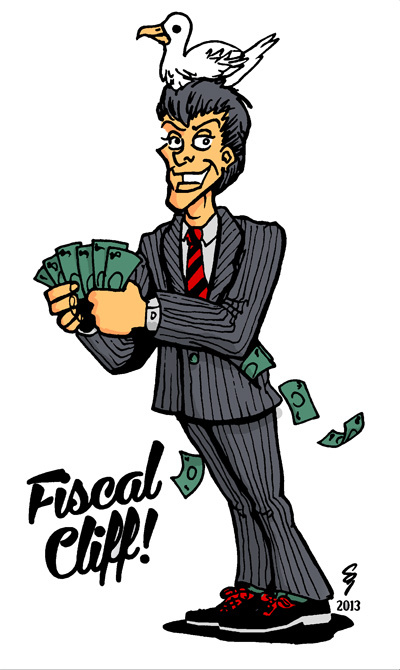 Fiscal Cliff likes attitudes, ideas, self-promotion and making money. He’s Patrick Bateman without the serial killer aspect, and with a dirty great rock holding him up. 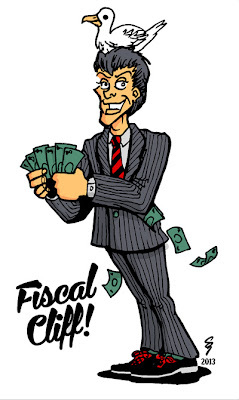 Fiscal Cliff thinks you should invest in his new scheme to give the homeless business loans at grossly inflated interest rates. Fiscal Cliff thinks you'd be better off with a high-risk share portfolio. Fiscal Cliff is launching a Kickstarter scheme to raise capital for a new financial advice app. 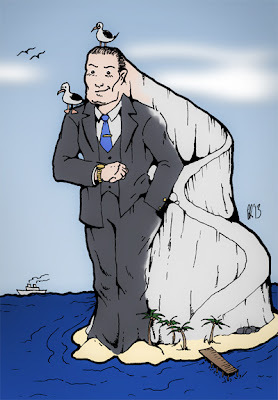 Pledge and Fiscall Cliff will reward you with a signed picture of Fiscal Cliff. I got quite excited by Fiscal Cliff, and mentioned the idea to another artist, the superb Saltmarsh, who come up with his own version. Once again, Dan does some mad colouring. So now there are two brilliant caricatures of Fiscal Cliff. Feel free to suggest more sleazy lines for everybody's favourite smooth operator.
" a big red dog, and Superman, and Batman — to get back to what really matters"
Fiscal Cliff wants to know to what is in your wallet (in case he missed anything first time thru). He has to go! As ONJ put it, "Let's get Fis...cal!"